Temprid Ready-to-Spray combines the fast-acting, broad-spectrum control of beta-cyfluthrin with the systemic residual control of imidacloprid to provide premium performance and efficacy. Not only has it been proven to be incredibly effective against bed bugs, but it also controls ants, roaches, termites, and tons of other pests. Ready-to-Spray technology uses no added solvents or propellants. Kills most of a population immediately, and offers up to 6 months of long-lasting protection. Effective against bed bugs of all ages and their eggs, even bed bugs resistant to pyrethroid insecticides. Temprid has been a huge hit in the commercial market. Its dual-action formula has been proven to be incredibly effective - not just against bed bugs, but against many household pests. Now, the power of Temprid is available in a much more convenient package: Temprid Ready-to-Spray. With Bayer’s Ready-to-Spray technology, there’s no mixing or shaking needed. You don’t need any other equipment, and there’s no prep time at all. Just grab the can and start spraying. 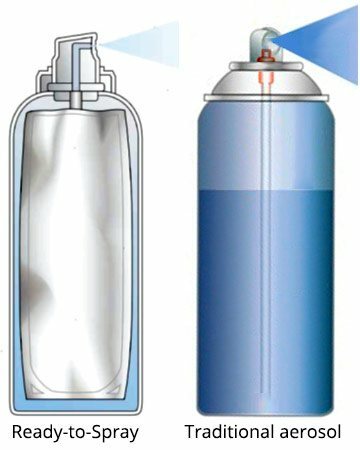 The Ready-to-Spray tech is unique in that it doesn’t use solvents or propellants, which normally take up a lot of the can’s volume. That means that when you buy Temprid, all you get is Temprid - the can doesn’t have any filler chemicals that you didn’t ask for. We really appreciate the trouble Bayer has gone to to develop a great spray product. Temprid Ready-to-Spray can be used while upside down, on its side, and in all sorts of goofy angles, and never hiccuped once in our testing. Bayer claims that it is clog-proof, and will empty every time. We haven’t spent too much time with the product, but so far we have not experienced any clogs. The Ready-to-Spray package includes two applicators: a low-volume nozzle for cracks and crevices, and a high-volume nozzle for open perimeter spraying. The low-volume tube is great for filling in those tight spaces that bed bugs love to hide in, like in between baseboards, moldings, and the seams in upholstery. The high-volume applicator was really impressive - the Ready-to-Spray is powerful, and can spray up to 12 feet out. This makes perimeter spraying a cinch. Since it uses the same dual-action compound as Temprid SC, Ready-to-Spray is effective against bed bugs of all life stages, including eggs. When used properly, it will knock out most of a bed bug population on contact, and provide residual control for up to six months. It is proven effective against strains of bed bugs that are resistant to traditional pyrethroids. Bayer is really shaking things up (pun intended) with its Temprid lineup. 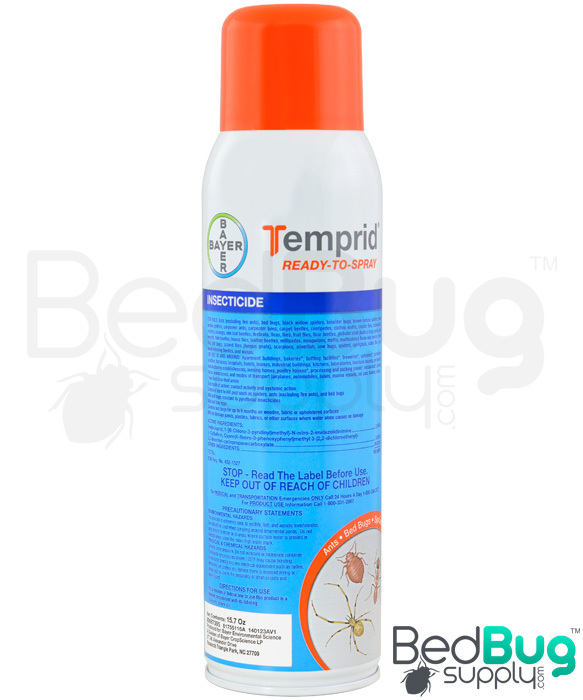 Temprid SC has been acclaimed for its success at controlling bed bug infestations, and Temprid Ready-to-Spray is prepared to work just as well in a more consumer-oriented package. For homeowners looking for a simple solution, combining Temprid Ready-to-Spray with the other steps in our 4-step solution is a great way to go. Temprid Ready-to-Spray combines the superior performance of Temprid SC with the easy-to-use Ready-to-Spray technology. Its dual mode of action has been proven to be brutally effective on bed bugs and their eggs. It even kills bed bugs that are resistent to to pyrethroid insecticides. Temprid's success is due to its unique dual-action approach. By combining the fast-acting broad-spectrum control of beta-cyfluthrin with the systemic residual control of imidacloprid, Temprid offers a compound that kills quickly and offers up to six months of residual protection. Now, the power of Temprid is easier to use than ever, thanks to the new Ready-to-Spray technology. This unique approach has many advantages over traditional aerosol bed bug sprays. It can be used while upside down or on its side, making application in tough-to-reach spaces a breeze. It contains no solvents or propellants, so you are getting nothing but Temprid, with no added cost. The Ready-to-Spray empties completely every time - no clogging or fizzing out. Shake well before use. For cracks and crevices, use the low-volume tube attachment and insert the injector tip into the space, then spray to fill the void. For spot treatments, hold the nozzle about a foot away from the treatment surface and spray for about 2 seconds per foot. For bed bugs, you can spray Temprid as a spot treatment on mattress seams and folds where bed bugs are found. You should also apply Temprid to your box spring, the inside of the bed frame or headboard, or as a spot treatment to upholstered furniture where bed bugs are found. Then, move onto cracks and crevices in baseboards, moldings, under floor coverings and carpets, inside closets and shelves, and behind curtains and picture frames. You can also use Temprid to treat the inside of empty luggage. Always allow whatever you sprayed to dry before coming in contact with it again. The safest approach would be to treat everything you want to treat in a room at once, then leave the room unoccupied while it dries. Avoid inhaling any vapors or mists. Always wash your hands with soap and water after spraying. Q: Where can you buy some temprid spray at over the counter? Professional-grade products like Temprid are very rarely sold in retail stores. They are normally purchased by pest control operators direct from the manufacturer, or through specialized distributors. We are offering Temprid online to consumers as a way of providing effective DIY treatment options. Q: Is this spray water based or oil based? Will it leave an oily residue? I used another product and it ruined our luggage. Aerosol insecticides are never oil-based as that wouldn't work with the aerosol propellants. Please note that Temprid is only labeled for use on the inside of empty luggage. Q: can I use the spray on my clothes? No. Do not spray any insecticide labeled for bed bugs on clothes you are wearing or intend to wear afterwards. You can kill any bed bugs hiding in clothing by washing and drying the clothes on the warmest settings allowed by the clothes' tags. Q: Can you used this spray in your car? This product is not labeled for use in cars. Make sure to always use a product as directed by the label and MSDS. Q: will temprid ready to spray freeze ? You should always avoid storing aerosols in extreme temperature, but we don't have a known freezing point available. Q: I thought I seen yesterday on your website where it said that your Temprid Ready-to-Spray residual spray came with a spray applicator but now I am not seeing that information. Does each can come with a straw applicator? Yes, each can comes with a straw applicator. This along with any product we have used from Bayer worked great. Watched the video from Bed Bud Supply and followed the directions. We have had a problem with bed bugs for a couple of months, been going crazy trying different products. This one works. We are on a fixed income, so were only able to purchase only one can. Will order more next month, however with that one can we saw a 99.9% reduction of the bed bug problem. Bed Bug Supply is the most helpful company there is for this type of problem. I would recommend them and their products to all my friends. Reviewed by: John from Lafayette, IN. Reviewed by: RICHARD AMBROZIAK from NEW JERSEY. We are satisfied with this product, and the customer service people are very nice. Reviewed by: Marvell from 8179 W4th Ave.. This product seems miraculous.Two days after spraying I saw several very dead bed bugs, but haven't seen or been bitten even once since. I am on a vigilant look-out too. My husband thinks I'm psychotic! Its only been about 2 weeks tho, so we shall see. If you don;t hear from me assume all is well. Reviewed by: Jill Deutsch from Macungie, Pa. I tried the powder and some of the other sprays, but the bedbugs came back. I then tried Temprid about 4 months ago, and no bedbugs so far! As the other reviewer mentioned, sometimes the can leaks, but NO BEDBUGS! Reviewed by: Charles from Jackson, MS. This product works extremely well at killing bed bugs. While I experienced seemingly complete eradication of the bed bugs, I am experiencing a recurrence. I've purchased the complete line of products for systematic control and I recommend following the complete set of instructions given by your exterminator. Reviewed by: Rochelle Simmons from New Haven, CT. Reviewed by: from West Palm Beach.